“The trestle across the Columbia River connecting the western and eastern trail sections at Beverly is currently CLOSED, gated, and unsafe to cross.Trail supporters hope for renovation of this trestle in the future. 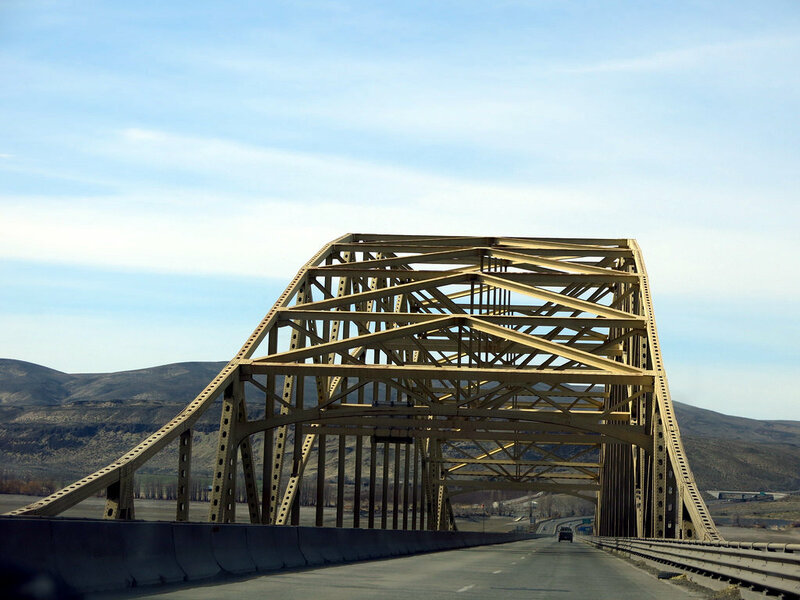 The nearest bridge across the Columbia River, the I-90 bridge at Vantage, does not provide for pedestrian or nonmotorized traffic. There is no shoulder nor sidewalk, and the crossing often involves heavy traffic and high winds. “Please contact your legislature and the State Parks Department to encourage them to fund upgrades and improvements to the John Wayne Pioneer Trail”. The Friends of the John Wayne Pioneer Trail posted this recently and of the bridges and trestles that need attention along this excellent multimodal route, this is chief among them. Of the many people I’ve talked to this bridge represents the most significant obstacle for completing the whole state crossing. The alternate Vantage crossing (via Interstate-90), the current way to cross the river, is dangerous if you’re in a car, and feels much like playing Russian roulette with a semi-automatic pistol while riding up the grade toward the eastern shore. A sketchy proposition; we shouldn’t be asking if an “accident” will happen, only when. This spring a number of public meetings have been held regarding the fate of the eastern portion of the JWPT, specifically, the 130+ mile stretch known as the Milwaukee Road. Two key issues have been distilled from the pot of problems adjacent landowners have raised and neither of these concerns directly addresses this critical problem with the trail. The Beverly Bridge and its alternate crossing are apparently an afterthought given the recent State Congressional attempt to give away a significant portion of this public resource. First, trespassing; supposedly users of the JWPT are violating property rights along this corridor. I will say that I find this claim somewhat specious, actual trail users are often attempting to move through the corridor and tend to be conscious of the narrow boundaries that define the trail. But it is worthy to note that access issues, such as the one presented by the Beverly Bridge, could be pushing users onto private property in order to bridge places along the trail that have been neglected beyond safe use. If the Washington State Parks department can get off their hands and address basic trail maintenance issues (with the help of the State Congress) then I think it’s safe to say that trespass will magically disappear. Second, the issue of noxious weed control keeps coming up. Folks, Washington State, has one of the most progressive invasive species programs in the country if not the world. Just like its Parks Department, however, it is understaffed and underfunded. Here again, the narrowly averted cure to this problem, proposed last year, is worse than the disease. If the sole source of weeds is the JWPT than reporting them to the correct authority is a far more workable option. My experience suggests that areas were noxious or invasives are common we’ll find that the trail is merely supporting populations at densities similar to adjacent private lands. I’m encouraging trail users to record the geolocations of noxious weeds, with a picture if possible, and report them to the appropriate County Weed Control Board. No one likes to get flat tires, and no one likes the potential problems an ingested noxious weed might present for a horse or livestock along the JWPT. The workable solution to this problem is control, and that means that both trail users and landowners need to make regular use of the reporting and control boards for each county while demanding accountability at the state level. Each community along the JWPT stands to lose much should this human powered thoroughfare ever be gifted into the hands of private ownership. The route ultimately stretches from the Pacific Ocean to Chicago, with branch lines spanning many northern states. And just within Washington State, it represents a nearly-finished bicycle autobahn. European countries have long recognized the importance of these networks. They represent potential for increased tourism, low-cost mobility, cultural conservation, and place of community pride-in-place. The potential economic impacts are more than enough to justify this fight; by “fight” I mean the sustained conservation and recreational development effort that is needed to reopen the Beverly Bridge. The point of this all being that a loss or even interruption in the JWPT represents a diminishment in the value of the public resource to the communities which still exist along the corridor. Both of the issues I’ve mentioned above, which have become the core focus of public hearings, are an attempt to appease a tiny handful of private landowners along the route. And, I would argue, distractions which threaten to delay or derail the kind of development that the trail needs to become an internationally recognized recreation corridor.